To kick off activities for National Surveyor’s Week, NSPS organized Surveying USA, a coordinated effort to promote the profession on March 19. Billed as the first-ever simultaneous, nationwide GPS survey, the event involved surveyors across the country spreading out to points high and low to collect data and interact with the public. By far, the American public most often observes surveyors in action while cruising along the highways and byways, which offers little chance to pause and find out just what we’re really up to. With many surveyors observing four-hour static GPS sessions that day and reminiscing about the good-old, early days of GPS, there was plenty of time for chatting. I coordinated with a few groups across the east coast to find out what surveyors were doing and to share their efforts with you. Starting down south, I recently visited with several surveyors in Tennessee where we discussed a variety of surveying issues, including their plans for the day. I asked Leonard Tusar, state coordinator for the event, and Allen Crawford, NSPS governor, to let me know how the day went. Here’s what he said. Leonard Tusar also sponsored a booth in the local library for the remainder of National Surveyors Week in order to engage the public in such a way as to place emphasis upon our practice. Leonard has furnished an article to the Daily News Journal in Murfreesboro in hopes of obtaining a press release to commemorate this event. This is the largest group effort that I’m aware of from the day, and I was particularly impressed with Len’s ongoing efforts throughout the week, manning his booth and greeting folks in the library. “A group of surveyors gathered to simultaneously locate by GPS static observations the tri-state corner of Maryland, Pennsylvania, and West Virginia along with several other monuments close by along the Mason-Dixon Line and the north-south line between Maryland and West Virginia. “A beautiful day for field work greeted us as we gathered for a brief meeting at Friendsville, Maryland, to organize our efforts, receive assignments, and head out to set up seven GPS units on seven different state boundary monuments. Fortunately, access was easy for our chosen tasks, and I suspect it differed very little from the early 1900s when these locations were finally settled. “The boundaries between Maryland and West Virginia (formerly Virginia) had long been in dispute in this area before the Supreme Court finally settled the issues from 1910 to 1912. The location of the tri-state corner has had a long and interesting history, and three of the monuments we located that day have each been considered the tri-state corner at one time. And there may be a fourth corner monument that we have not yet searched for. 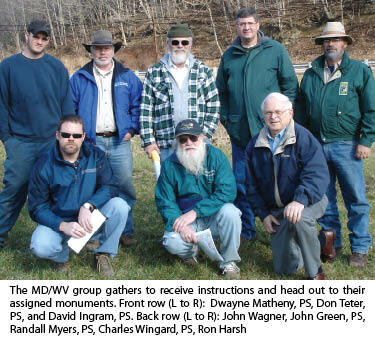 “The West Virginia chapter of Surveyors Historical Society recently decided to take on the task of researching the history of the Maryland–West Virginia line and to locate by GPS all the monuments along the common line. Surveying USA 2011 afforded us the perfect excuse to get started. For a line that is supposed to be a straight, meridian line, there sure are a lot of nooks, crannies, and bends, and not a single course is supposed to have a bearing of ‘north.’ Interesting history and more reports to follow.” We look forward to hearing more of this story. Finally, I caught up with a group from the District of Columbia Association of Land Surveyors (DCALS) who occupied a handful of points throughout our nation’s capitol. As David Ingram mentioned, around Maryland the day developed into a great day for surveying with nary a cloud in the sky, a steady breeze (sometimes a bit too steady…), and tons of sun! D.C. is notorious for its low-lying, soft-soils areas. The Mall lies low along the Tidal Basin and Potomac River, and much of the area rests on fill from early in the city’s history. But with every low point there is a corresponding high point, and that’s where I met Joe Evjen, who works with NGS in the OPUS program. Joe occupied Point Reno, a National Park Service monument set in 2007 to mark the highest natural elevation point in the district, at 409 feet. The point is located at Fort Reno Park, which saw action in what is reportedly the only Civil War battle to take place in D.C. Farther south, at probably one of the lowest points in the city, was Bill Murphy with Leica Geosystems. Bill’s point was a tidal benchmark on the southwest waterfront seawall, near Benjamin Banneker Park. Its location on the narrow, concrete seawall, beneath an iron-rail fence, called for an interesting setup. Bill opted for a carbon fiber pole supported with a bipod. The setup worked well, but there were definitely some tense moments each time the wind from the river kicked up above “stiff breeze” level! Last, but not least, in certainly the most public spot of the day, were Tom Yoakum (D.C. coordinator), Joe Allegra, and Neal Isenstein at the Jefferson Stone (Pier), adjacent to the Washington Monument. The Jefferson Stone has a long, interesting history that was thoroughly documented by Silvio Bedini, noted historian emeritus with the Smithsonian Institution, in his book by the same name (available from Professional Surveyor Magazine). 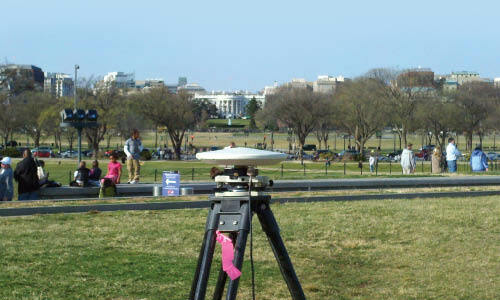 According to a report by Dave Doyle, senior geodesist with NGS: “The Jefferson Pier marks the first meridian of the United States and was originally established in 1793 on a line due south through the center of the White House at the intersection of a line west from the center of the Capitol. The original point was marked by a wooden stake and replaced by a stone pier in 1804. The monument was removed and replaced several times until finally being restored in 1889 under the direction of Colonel O.H. Ernst, officer in charge of public buildings and grounds. The Mall was busy with visitors that afternoon, some to see the Washington Monument, some lounging around, and many flying kites in the steady breeze. Several people stopped to chat and see what was going on, but most went about their business. It may be that many people have become accustomed to GPS; then again, it may be that they just don’t understand and don’t care. I’m not sure which it was, but going back to my conversations in Tennessee, and as Dave mentions above, the majority of people have no clue what we do, why we do it, or the significance of all those markers in the ground that we revere. It’s hard to understand just how we got to this situation, but we must work to change it, both through organized events such as Surveying USA and on our own, every day.